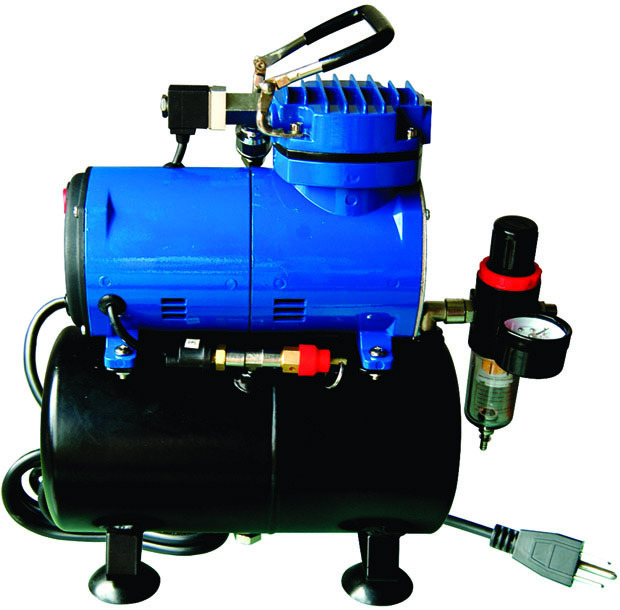 The air compressors Paasche D3000R are designed for use in modeling and illustration, make-up, fishing lures and other hobbies. 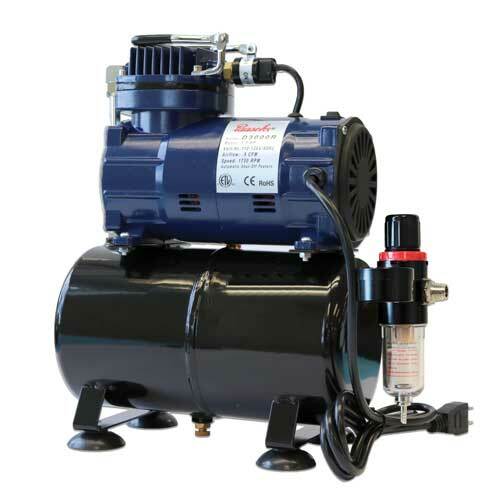 You’ll like this air compressor on your first try. It is easy to set up and operate, moreover the unit does not require oil or any other lubricants. ⅛ horsepower piston-driven motor, which operates on 115 Volts, 9 AMPS, 1 Phase, 60Hz and draws. 1 gallon storage tank allowing not to engage the motor constantly and wear quickly. The sturdy air tank stores reserve air volume and reduces pulsation. The air tank also helps to cool down the air, to eliminate pulsation and spitting during spraying session, that provides a constant and uniform air flow without surges. 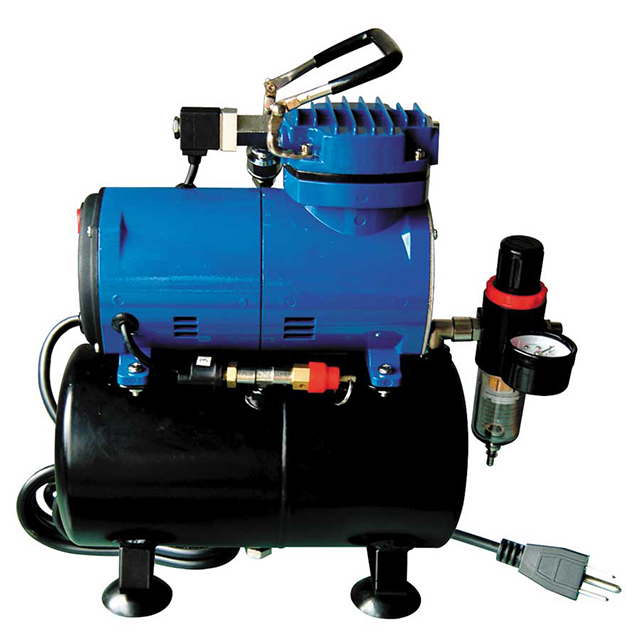 To deliver high quality results the Paasche D3000R air compressor features also an auto shutoff regulator. Once the compressor reaches the maximum pressure in the tank, it switches off automatically and starts after the airflow passing through the airbrush relieves tank pressure. With the regulator you can precisely adjust the pressure to any level you want, that makes possible for the unit to operate even at a low pressure. 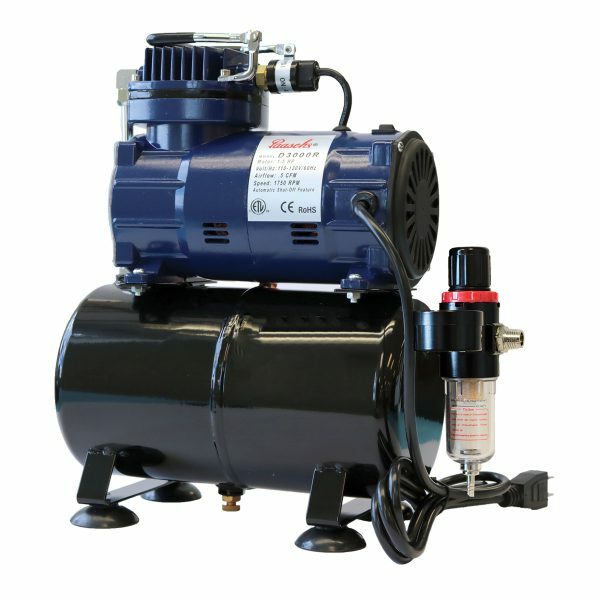 The compressor motor is equipped with the overload protector, that switches off the motor in case it overheats. To avoid moisture accumulation inside the air lines during continuous uses the air compressor has the built-in moisture trap, that makes painting enjoyable and uninterrupted process. The unit takes up little space and can be easily picked up and moved with the handle on the top. It produces the noise level of 47 dbl that is not louder than a dishwasher and the solidly built construction prevents the unit from rattling and walking vibrations. Paasche air compressors have a well-earned reputation among artists and avid modelers due to their price and outstanding quality. We already have many users satisfied with Paasche D3000R Compressors.